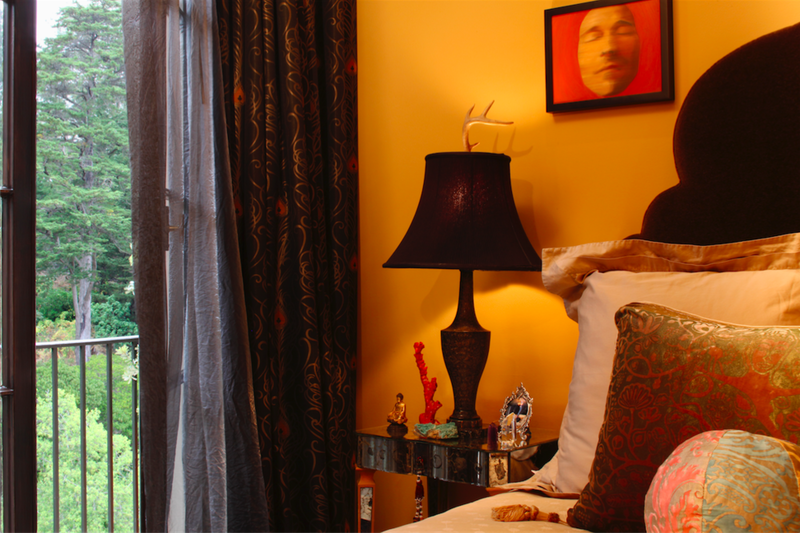 This 600 square feet condo was transformed into an intimate home infused with an eclectic style. In the living room, we put the seating area with a Hans Wegner Papa Bear chair and a Warren Platner bronze wire sofa at an angle so that people could circulate through it more easily. We chose a lot of fabrics with wood grains — such as those in the curtains and on the armchair, as it seemed to pull the trees inside. Choosing lightweight and flexible pieces was key to making the home work. The demilune console unfolds to become a circular table and extra seating for dinner guests. The Knoll table and dining chairs, original Eon seats from Seattle’s Space Needle, are lightweight, low profile and easy to move.